Got just about the worst news I could get since taking a role developing teachers for my school district. We’re out of money. Don’t get me wrong. We teachers are used to having to do more with less. Making something out of next-to-nothing is our middle name, and we’re far better at it than we should have to be. That was the news my assistant superintendent called me into her office to learn. 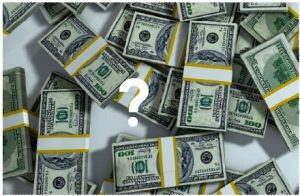 The latest budget projections show that our educator effectiveness grant—the grant that’s been funding two years worth of wonderful teacher development at all levels and in an all content areas—was about to run dry. Now I would have to list and prioritize all the remaining professional learning for the year to determine what we still might do and what would need to be redlined. One site is on a two-year mission to raise writing scores. They’re already up 27%. Another is determined to make checking for understanding and giving feedback meaningful for both teachers and students. This group asked if they could employ a Genius Hour structure to their teacher growth activities next year around these topics. The third middle school is beginning to know their students so well that the Universal Design for Learning approaches they are implementing are meeting the needs of every single one. For a school that hasn’t been used to working this closely together, their progress represents a major sea-change and a hopeful new course. 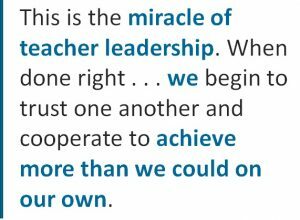 This is the miracle of teacher leadership. When done right and when teachers are nurtured in an environment that is safe, where risks and mistakes and encouraged, we begin to trust one another and cooperate to achieve more than we could on our own. Leading becomes a personal choice (as Simon Sinek reminds us in his wonderful TED talk), not a title or a rank simply given. Each member’s sense of accomplishment fuels his or her desire to push on. When a group of teacher leaders is shown how to lead effectively, and they are given the tools to drive the work themselves, the capacity of that group to continue the work on their own is great even when budgets are not. I am seeing all three groups knit up their passion and enthusiasm for getting better together with the research about how best to guide their kids and colleagues toward success. They are doing incredible work that’s not just inspiring. They are building collective teacher efficacy, something John Hattie says is critical for improving student learning.